Angry Birds Seasons is back with a all new Summer update. 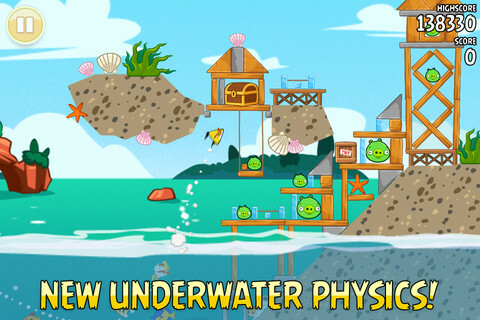 With the success of Angry Birds Space and it’s all new physics, Rovio has added new underwater physics to this year’s summer version of Angry Birds Seasons. This time were are taken to the mythical land of Piglantis. The goal is the same; save the eggs from the pigs, but with the new underwater physics, we get to experience some new game play. When shooting the birds into the water, their buoyancy shoots them back up, so getting the right angle can be a challenge. I’ve been finding this update to be really hard, but once you figure out the new physics it is tons of fun. This is a free update to angry Birds Seasons, and is available now!